Perhaps to many people in the West, Bangladesh is just a word on a clothing label. Behind the label is little knowledge of the country and until recently, a dim awareness of the conditions under which the clothing is produced. Bangladesh is one of the world’s most densely populated countries and the eighth most populous with a population of 160 million people. Until 1947, it was part of the British Indian Empire and at that time, became a part of Pakistan. It won its independence from Pakistan in 1971 following a liberation war that cost the lives of three million Bangladeshis. Most of the country is less than twelve meters above sea level, which makes climate change particularly concerning for the country. It is a county that is already vulnerable to natural disasters, such as deadly cyclones in 1970 and 1991, the worst flooding in modern world history in 1998, and is generally susceptible to cyclones, flooding, and drought. The country is ranked number one in the world for the number of children suffering from malnutrition, 76% of urban families were under the recommended caloric intake, and literacy for men is 61% and 52% for women. This overview paints a dismal picture of Bangladesh, but should serve to illustrate the real challenges of poverty and to development in the country. Although climate, natural disasters, or the independence movement may all be interesting topics to explore, the real focus of this presentation is Bangladesh’s garment industry. Bangladesh is the world’s second largest exporter of clothing to China and has over 5,000 garment factories. The garment industry employs around 3.5 million people, of which, more than four-fifths of its $20bn production is exported to the west (Guardian UK). Bangladesh’s behemoth garment industry is built upon the lowest labor costs in the world, with garment workers earning a paltry $37 a month. These low wages are especially attractive to Western companies because of rising labor costs in China and the fact that there are virtually no unions in the country (Socialist Worker). In fact, according to a report by the consulting firm McKinsey and Company, as of 2011, 80% of United States and European textile companies intended to move from China because of rising costs, citing Bangladesh as the next hot spot. This comes as little surprise to socialists, who have long understood the cosmopolitan nature of capitalism, which forever searches for the lowest wages, weakest regulations, and greatest ability to exploit workers. The enormous cost of these low wages is the health and human cost paid by workers, as spotlighted by the recent accidents in Bangladesh. Bangladesh was not always the juggernaut of sweatshops. Historically, the Bengal delta was a thriving trade route which connected China, India, the Middle East, Europe and East Africa. The biggest blow to the economy was the 1971 Liberation War against Pakistan which resulted in extreme poverty and economic loss. To recover from the war, the country began to focus on its ready-made garment export industry (Alternet). The economic shift over the subsequent decades is best described by economics professor, Anu Mohammed, who summarized the history as such: “Until the mid-1980s, jute was the main earner. Then the IMF and the World Bank arrived. Under their aegis, privatisations and public spending cuts caused unemployment to rise and led to massive dependence on imports and the decline of local industries. Bureaucrats in the main parties, army officers, the upper echelons of the police and the sons of prominent families jumped at the opportunities (Middle East Online).” Thus, the garment industry in Bangladesh arose out of a larger globalization project. This project consists of IMF and World Bank policies which promote low wages, weak unions, privatization of state enterprises, and liberalized trade. Europe and the United States have rewarded neoliberal policies by opening their markets to garments made in Bangladesh. It was the 1974 Multi-Fiber Agreement that initially shifted the North American market to its garments. The agreement imposed quotas on Asian garments, but Bangladesh did not fall under the umbrella of quota countries. This made it an attractive location for investment (AlterNet). More recently, former EU trade commissioner Pascal Lemy summarized European attitudes towards trade in Dhaka in 2001: “The European Union is favourably disposed to support Bangladesh in its efforts to achieve ... greater integration into the global trade system by opening up new trade possibilities and encouraging greater market penetration.” As a result, between 2000 and 2012, Bangladesh’s textile industry more than quadrupled (from $4.8bn to $20bn). New York bank Goldman Sachs even listed the country as one of the Next Eleven to join Brazil, Russia, India, China, and South Africa in development, despite the fact that it was still one of the poorest countries in the world (Middle East Online). Despite pressure from unions and labor activists, U.S. government officials are reluctant to end preferential trade agreements, including tariff breaks, with Bangladesh. Because Bangladesh sells $4.5 billion worth of goods to the United States each year, labor activists argue that ending preferential trade under the WTO’s Generalized System of Preferences would put pressure on the Bangladeshi government and producers to improve conditions (New York Times). Globalization and more generally, the perennial nature of capitalism to increase profits by exploiting labor, resulted in conditions of low wages, lack of regulation, few unions, and unsafe conditions. These conditions created a recipe for disaster. One such disaster occurred on January 7th 2013, when a fire took the lives of eight garment workers, each under the age of 16, at the Smart Garment Export, a small factory of three hundred in central Dhaka. Prior to this, there was a fire at Tazreen Fashions on November 24 2012, which killed 112 people and injured thousands. Workers at the Tazreen factory labored ten hours a day, six days a week, earning $38 a month. Among the brands housed in the nine story building were Disney and Wal-Mart. The building itself was locked to prevent theft, which meant that workers were either unable to escape or forced jump to their death from windows on upper floors. The factory also violated various fire codes, such as storing flammable materials on the ground floor and next to stairways (Middle East Online). This mirrors the Triangle Shirtwaist Factory Fire, which in 1911 took the lives of 146 New York Garment workers. Like the Bangladeshi workers, the women at the Triangle Shirtwaist Factory were locked in the factory, which inhibited their escape, causing greater casualties. In this way, although the location and century has changed, capitalism has changed very little. Dolwar Hussain, who owned the Tazreen factory, was never charged for the accident and was a member of the Bangladesh Garment and Exporters Association (BGMEA) an association of 4,000 garment factory owners (Middle East Online). Bangladeshi officials quickly assigned blame to Islamic terrorists for the fire at the factory. Sabotage and terrorism was again blamed when on June 5th, up to 600 Bangladeshi factory workers fell ill from polluted or poisoned water (Huffington Post). The most likely and obvious cause of these incidents is the everyday terrorism of capitalism against workers. In all, there have been over 1,800 deaths in fires and building collapses in Bangladesh since 2005 (Alternet). Smaller fires are reported at a rate of more than six per month (Solidarity Center). Some accidents are dramatic and receive world attention, but most are overlooked occurrences with deaths and injuries that happen in ones and twos. For instance, following the Savar building collapse, there was another garment factory fire which killed eight workers. Each year, at least a hundred workers die in Bangladesh doing building construction. Last year, fifteen workers died ship-breaking and a similar number in rice mills. Tanneries are also dangerous due to accidents as well as exposure to cancer causing chemicals. Although there are 100,000 factories in and near Dhaka, as of 2012, there were only 18 inspectors. The inspectors themselves have close ties to management, offering warning of their arrival and fines averaging $13 (Human Rights Watch). Most politicians are also connected to the garment industry, which means that cronyism complicates any meaningful regulation. The most obvious and stunningly terrible accident in Bangladesh’s garment industry was the Savar 2013 Collapse, which occurred on April 24, 2013 in Savar, a suburb of Dhaka. Over 2500 workers were rescued for the collapsed building, but 1,127 workers died when the eight story Rana Plaza fell apart. Over half of the victims were women and some children at the factory nursery also died. The upper four floors of the building were constructed without a permit and cracks were noticed by inspectors the day before. The building itself was only intended for shops and offices, not heavy factory equipment. Despite the warnings from the inspectors, workers were ordered to work (New York Times). Since these workers were not unionized and were threatened with loss of pay if they did not work in the unsafe conditions (Solidarity Center). In the wake of the incident, leftist parties, BNP, 18 Party Alliance, in the country demanded a commission to look into unsafe buildings and the arrest of owners. Afterwards, four individuals who owned the building were arrested. Sohel Rana, who has been identified as the main villain, was arrested near the Indian border a few days later (New York Times). Sohel Rana was the owner of the building and a prominent local member of Bangladesh's ruling Awami League. Allegedly, he skirted mandatory permits by appealing directly to a local politician, who approved construction when Rana complained that the permit process was too lengthy (Socialist Worker). At the end of May, the Bangladeshi government released a four hundred page document which blamed the mayor for granting the building construction and the owners of the building for demanding that the workers work in unsafe conditions. The government determined that power generators on the upper floors shook the building each time they were on. Cracks appeared on April 23 and an engineer was called and deemed it unsafe. Despite this, Rana and the factory bosses ordered the workers to return (New York Times). At the same time, Western media and political figures also clamored to place blame, which mostly fell upon the owners of the building, sub-contractors within the country, general denouncements of slave like conditions, or at times, the brands whose goods were manufactured in the buildings. Factories housed within the building included such brands as Walmart, Benetton, Children’s Place, Mango, Monsoon, Joe Fresh, and Primark. These brands are important, but little different than other clothing brands operating in Bangladesh or any other sweatshop abroad. Therefore, although the owners and brands are culpable, it is inasmuch as they are part of a larger system of global capitalism and its race to the bottom wages. Although there have been arrests of building owners, the task of actually compensating the victims has been slow going. BGMEA promised to pay survivors their outstanding salary for the month of the collapse, plus a month's pay for every year worked at Rana Plaza, have received the full amount due (Guardian UK). On May 23, BGMEA announced that it would not pay the wages of dead victims of the collapse citing that the victims would be compensated by the government. Indeed, the Prime Minister’s Office provided grants to victim’s families, but victims argue that was not the same as wages and not what they were promised from BGMEA. 200,000 taka was supposed to go to each of the victims’ families, but as of May 23, just over 200 received this money (Dhaka Tribune). The government and BGMEA paid for medical expenses for the workers as well as some payments of 20,000 taka for funeral expenses, but victims cited that this was not enough to cover the costs. An additional sum of 100,000-600,000 taka is supposed to be disbursed by the government to bereaved families, but no date has been specified. A few retailers, such as Primark and Matalan, have offered to compensate victims as well (Guardian UK). The compensation process is muddled by the fact that many victims had informal or verbal contracts with no proof of their employment. Some bodies have not been recovered or identified, which also makes claiming compensation difficult. Without compensation, traumatized workers at the collapsed Rana building have little choice but to again find employment in the garment sector. Since the accident, there have been massive worker protests in Dhaka. On International Workers Day on May 1st, thousands of workers protested in Dhaka to demand better wages and the death penalty to Sohel Rana (Guardian UK). Mass protests in the Ashulia Industrial Belt, which produces 20% of Bangladesh’s exports, forced the closure of 300 factories in early May. However, after a few days, the government ordered them re-opened. At the same time, the cabinet approved new labor laws which allowed for the formation of unions without prior approval from factory owners and the establishment of a wage board to consider an increase to the minimum wage. Minimum wage Bangladesh is the lowest in the world (Rueters). Since the establishment of the board, the BGMEA has vowed to increase minimum wage, but has not committed to a number. Workers in Bangladesh are demanding an increase to 3000 taka a month, or 13 cents an hour. Currently, wages are at 930 taka a month, an amount that was set in 1994. Since 1994, the cost of living in Bangladesh has increased by 50% (Labour Behind the Label). So, while the garment industry has dramatically increased in value over the last ten years, the workers have not even enjoyed the most modest wage increases. Protests have continued through May and June. On Wednesday June 5th, police used teargas, live ammunition and batons to break up a demonstration by former Rana Plaza workers. The workers were there to protest BGMEA’s violation of the compensation agreements. Although BGMEA promised to give four month’s pay, workers felt that it reneged on the agreement by only giving one month’s pay (Socialist Worker). In all, 1000 protesters from the families of victims turned out to demand compensation and for the creation of an official list of victims. They blocked the highway and staged a sit in until they were forced by the police to leave (Huffington Post). The following day, garment workers from several factories again met to protest with a twelve point demands including higher wages and overtime payments. The protest became violent when business owners, the Awani League, and BCL attacked the workers. Police again intervened with batons, gas, and rubber bullets, resulting in 50 injuries (Dhaka Tribune). On May 25th, up to 20,000 people took to the streets in the Ashulia industrial area, again with violent response from the police (AlterNet). Other significant events in the fight for better wages and conditions include a May 29th incident at an export processing zone factory wherein workers stopped working and confined management to the building when it was announced that only a few of them were receiving wage increases. Another work stoppage occurred on June 1st involving hundreds of workers and over a dozen factories, again in the export processing zone. Police injured at least fifty workers and several of the factories were damaged during the conflict. As the result of these and other protests, Labour behind the Label, cites that over 4,000 workers have been arrested, with two confirmed deaths, and hundreds injured. There are also reports that union officials who were not even at the protests were arrested and beaten by police (Labour Behind the Label). This raises the question of what can be done here, so far away from these protests and labor actions. An initial response seems to be to simply not patronize stores or brands that use products from Bangladesh. Although there is some merit in boycotting these goods, the tactic suffers from the problem that it is individualized, private, and puts too much stock to the notion of consumer sovereignty. Nevertheless, if this is done in mass, with precise targeting, public actions, and visibly, it may exert some pressure on brands to increase wages in Bangladesh. Yet, as Vijay Prashad notes, “These Bangladesh factories are a part of the landscape of globalization that is mimicked in the factories along the U.S.-Mexico border, in Haiti, in Sri Lanka, and in other places that opened their doors to the garment industry's savvy use of the new manufacturing and trade order (Socialist Worker).” Therefore, the problem is not a problem with the industry in Bangladesh or even a few brands, but all countries and all brands. This is why a boycott should be part of a larger movement against globalization. More importantly, the workers of Bangladesh themselves are not calling for a boycott of these products or companies, so a more effective strategy would be to support their demands, follow their example, foster worker solidarity and internationalism, and build a movement against globalization. Thus, rather than boycott, U.S. activists should exercise solidarity. Worker solidarity may involve public protest of the corporations that source their products from Bangladesh, pressuring them to give better wages and working conditions. An example of these kinds of actions is demonstrations against GAP’s shareholder meeting in San Francisco in late May to demand that they adhere to stricter building and fire codes in Bangladesh (AlterNet). More recently, protestors and striking Walmart employees descended upon Walmart’s shareholder meeting in Fayetteville, AK to demand better conditions for Bangladeshi workers. Walmart’s stocks are at near an all-time high, yet it has refused to sign an agreement with other Western brands to improve working conditions (Common Dreams). The extravagant meeting featured celebrity performances and appearances by Hugh Jackman, Tom Cruise, Kelly Clarkson, and Jennifer Hudson. Nevertheless, some activists, as shareholders or invited guests, were able to address the meeting, including former garment worker and director of the Bangladesh Center for Worker Solidarity, Kalpona Akter, who asked Walmart to make good on their empty promises to improve working conditions. Likewise, Janet Sparks a striking worker from OUR Walmart pointed out that Walmart CEO Mike Duke made over 1,000 times the salary of the average Walmart association (The Nation). Despite pressure from activists and even shareholders, Walmart has made no commitment to improve safety standards in Bangladesh but has instead promised that their own inspectors would examine factory safety. 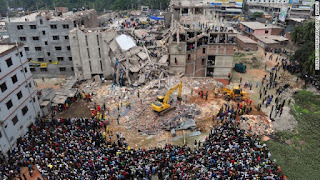 Since the Savar collapse, Walmart inspectors found cracks in the walls of a factory producing Wrangler brand apparel, but no measures have been taken to stop production or secure the safety of the workers there (AlterNet). This is why linking and internationalizing labor struggles, from Walmart strikes here to the factory collapse is Bangladesh is essential in the fight against global capitalism. Worker solidarity can also involve donating money to Bangladeshi union campaigns or towards the funding of factory inspections. Beyond this essential struggle of workers, there should be a mass movement against globalization to curtail preferential trade, free trade, and deregulation. Unless struggle is massive and international, companies can simply find new places with fewer regulations and wages, such as Disney, which after the Tarzeen fire, sought new suppliers in Vietnam and Cambodia. Only the effective organization, internationalism, and solidarity of the world’s workers can put an end to tragedies such as the Savar Building Collapse, justice to its victims, and a lasting vindication of the rights of all who are made to suffer in this system. > The article above was written by Heather Bradford.